Posted on Tuesday @ 11.20pm IST. Highest 41.1c at Solapur and 40.5c at Akola. The light blue shade in the Map of Tuesday's highs shows the hottest region.... comparatively small for this time of the year with lower than normal temperatures. Hotteste in Pakistan was 39c at Dadu. Thundershowers occurred on Tuesday in 1/2 places in W.Bengal (Chanbali and Kolkata 1 cm), AP and a few places in East Vidarbha (Nagpur 5 mms) and S.I.Karnataka,and in Kerala. A-6 has formed an induced UAC over Rajasthan. Likely to move Eastwards, and cover precipitation over N.Rajasthan and adjoining Punjab, Haryana and parts of Delhi NCR. A LWD from the UAC runs Southwards (in lower levels) across west MP, Vidarbha, Marathwada into Interior Karnataka. accordingly, the precipitation forecast map was given yesterday. In the meanwhile, Ibri in Oman received 23 mms, Jabal Shams 13 mms and Muscat Ap 2 mms till Tuesday morning. Quetta in Pakistan measured 31 mms, and Khuzdar 19 mms. Day temperatures were very low in UP and adjoining regions on Sunday 21st April. This map shows the region of below normal temperatures on Sunday...some prominent below normals. Bareilly - 29.9 C (-9 C), Lucknow - 26.3 C ( -13 C), Varanasi - 25.0 C ( -15 C) Allahabad - 27.8 C ( -13 C),Gorakhpur - 21.5 C ( -18 C). The unusually low day temperatures is shown here in the Maximum temperatures map for Sunday 21st April. In the last 3 days, some regions of Gujarat have received as much as 80-90 mms of accumulated precipitation. Reports of rain/Thundershowers were received from Saurashtra, Baroda, Surat and Bharuch. Sindh region in Pakistan had good rainfall on Sunday 21st and Monday 22nd. Till Sunday morning, Hyderabad (Sindh) measured 21 mms, hotspot Jacobabad saw 12 mms, Rohri had 7 mms.Islamabad had 7 mms of rain till Monday morning. On Monday 22nd, Karachi experienced a thunderstorm. several regions of Sindha and adjoining Kutch in India had heavy showers, with Bhuj receiving heavy showers Monday evening. 1. An UAC over Oman, Southern Oman , will bring heavy showers in Southern Oman, and fairly good rains in Muscat on Tuesday , Wednesday and Thursday. Can expect a drifting thunderstorm from the East into Goa and Belgaum on late Wednesday/ Thursday night. 3. WD A-6 moves into Northern Pakistan and Northern India from 23rd Apri for the next 3 days.. Rains will be covering Northern Pakistan, Pakistan Punjab. In India, Kashmir, Punjab, parts of Northern Haryana, HP and Utterakhand. I would expect a thundersquall in Delhi NCR with rainfall in some parts on Thursday 25th. Surrounding Northern Rajasthan (Jaipur and Southern regions of Jaipur) and adjoining UP too may get Thunder squalls in some regions. Nepal gets good rainfall on the 3 days from Tuesday thru Thursday.Kathmandu getting the evening thunderstorm which may be heavy. 4. After a good 4 day spell, rainfall decreases totally from Gujarat and MP from Tuesday. Mumbai: Partly cloudy skies, with towering cumulus "fluffy" clouds. Night temperatures expected to rise. Temperature in the 33-24 range for Santa Cruz. Outer townships see a rise in day temperatures with cumulus clouds. Some far thundery developments on Thursday in the E/SE direction. New Delhi: Hazy skies, with temperatures gradually rising back to 40c by Wednesday..Thursday evening could see some thundery developments in some parts with rain in some parts. Goa: Partly cloudy, and a thunderstorm possible on Wednesday/Thursday. Surat: Back t sunny and hot days, rising back to 38c by Wednesday. 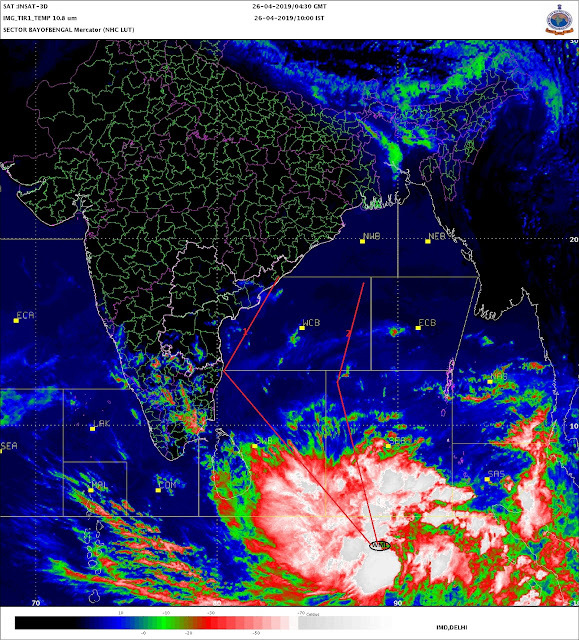 Will this April rain have an adverse impact on overall monsoon in guharat region. Kathmandu temp taking a dip as well. A few hours drive away from here up in the mountain, I experienced very heavy snowfall on 20th and 21st - even at that altitude unusual for mid april. a total of 31 mm of rain fell in the same period. Some unusual weather for Nagpur for late april. Continuous 4-5 days of pleasent day temperatures. I dont remember any year in which the temperatures have gone down for 4-5 days at a strech in April. It used to be a 1-2 day phenomenon. Wow : Dhari (dist Amreli) 120mm, Dhari_arg (dist Amreli) 110mm from WD trough !! Haha.. Seems like monsoon season figures !! Source : Regional IMD Ahmadabad. Rajkot max temp 37.9c & Surat max temp 36c for today. Chennai max temp for today : NGBKM 35.1c, MNBKM 35.8c. Normal to below normal day and night temperatures, below normal humidity, clear daytime skies and few white fluffy cumulus clouds towards evening, don't seem to be a recipe for thunderstorm on Wednesday night in Goa! I'm so eager to find out!